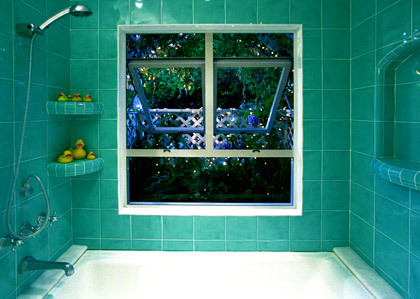 This project was for my own house, a 1920's bungalow in Pasadena. 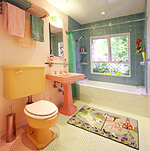 The bathroom was in terrible condition, and had been poorly remodeled at least twice before we purchased the house. 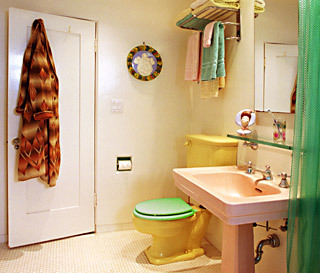 The existing bath had a poor floorplan and unappealing finishes. I demolished the old bathroom entirely, opening the house to the framing. The windows is new and thoroughly waterproofed. I took care with a number of details to create a 1920's feel without trying to create a literal period reproduction. I was especially please with the rounded plaster details. In keeping with a 1920's streamline aesthetic, no moldings are used in the project. Because the room is small, and to create visual consistency, I used recessed fixtures, accessories and details wherever possible. The linen cabinets, light fixtures, medicine cabinet, wall base and decorative display alcove are all recessed into the ceiling and wall surfaces. 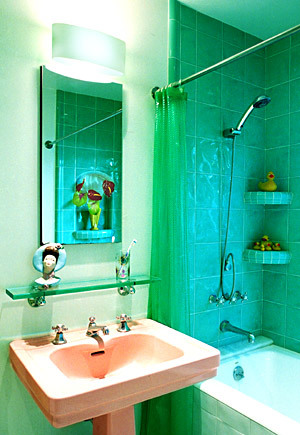 Bathroom renovation, Pasadena California by Mike Roy, published in House Beautiful Kitchens and Baths. Lighting, environmental, interior design. 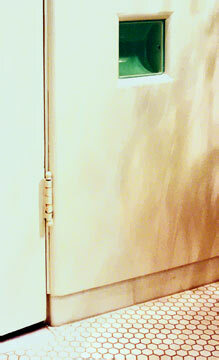 Ceramic tile details, recessed marble wall base. 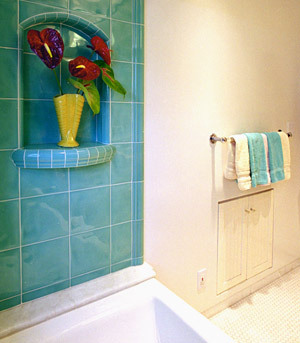 The round Della Robbia ceramic Madonna is the only permanent decoration in the bath, both because it is waterproof and because its palette and form compliments the built-in tilework. 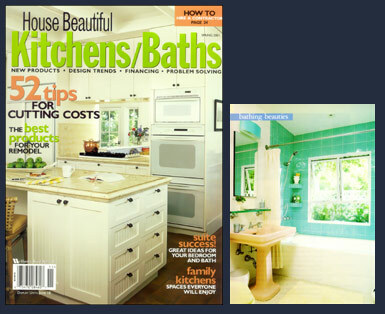 The project was published in the Spring 2001 edition of House Beautiful Kitchens and Baths.